Michael Pollan. Random House, New York, 2001. Michael Pollan likes to write about gardens. In his botany-gone-haywire effort, The Botany of Desire, Pollan tells the story of four domesticated plant species — the apple, the tulip, the potato, and marijuana — from the point of view fo the plants. Seen from a plants perspective, humans are like some super-effective bee, a long distance pollinator par excellence. In this delightful and informative book we trace how apples spread westward with American settlers (the Johnny Appleseed myth made real), how flower fanciers made tulips the dot coms of a prior centurys economic bubble, how breeders shrunk the size of marijuana plants while increasing their potency, and how french fries have led to potatoe success. Pollans tongue-in-cheek subject is how the flowering plants have prospered by seducing humans — like bees — into fostering their reproduction through rewards like food and beauty. When writing about the human invention of agriculture, he says It makes just as much sense to think of agriculture as something the grasses did to people as a way to conquer the trees. The idea that humans and other species have profoundly influenced each others evolution is a time-honored one — Darwin devotes the first chapter of On the Origin of Species to it — but Pollan makes the case delightfully. Parts of Pollans book are as profound as anything in Drawin. His discussion of the evolutionary implications of the genetic engineering of foods like potatoes made me think of wildness in a new way. Why the title of the book? 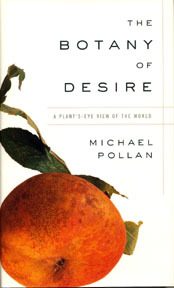 It states Pollans central thesis, that human desire shapes the nature of plants, only to be shaped by the plants in turn. Botany has never been more fun as seen from the plants perspective.